Spartan Race to a Million Contest Supports the Troops! Here is another way to help Operation Gratitude before the year is over! Join in to support our cause and raise funds to send care packages to deployed troops by simply “liking” the Spartan Race page and entering their “Race to a Million” contest on Facebook! Each contest entry will generate a 20-cent donation. 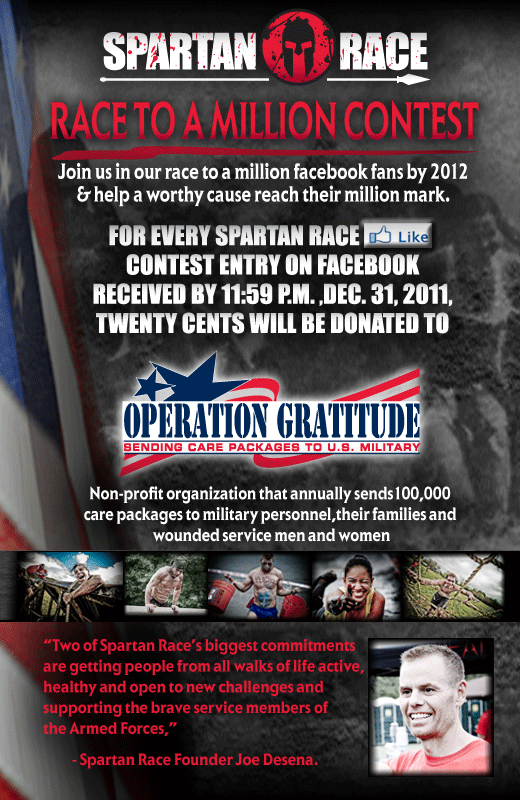 Plus, if Spartan reaches One Million “Likes” by the deadline of December 31, 2011, Spartan will donate ANOTHER $50,000 to us! Thank you for your help! Learn more about Spartan Races near you by visiting their cool website to see how their fun obstacle course challenges work! This entry was posted in Uncategorized and tagged Afghanistan, care packages, charity, deployed, Facebook, non-profit, obstacle course challenge, Operation GRatitude, race, SpartanRace.com, troops, U.S. service members. Bookmark the permalink.